Just as the session was due to start, it began to rain, though it didn't look as if it was going to do much more than dampen the Tarmac (along with most people's enthusiasm). However, it soon stopped, and couldn't really be considered real rain. Charlie Kimball (Carlin Motorsport) was fastest early on, with Marko Asmer (Hitech Racing) slotting into 3rd, but the times were a long way off those of the earlier session. It would be a while before Lewis Hamilton (ASM F3) needed to feel even vaguely threatened. It was all a little odd, actually, in the early stages. Stephen Jelley (Menu Motorsport) was the next to improve, going fastest of the session, and he was joined at the top of the order by Hannes Neuhauser (HBR Motorsport) and Christian Bakkerud (Carlin Motorsport), the three of them being the first to break into the 1.38s. They were soon joined by Nico Verdonck (Team Midland Euro Series), before Steven Kane (JB Motorsport) went fastest in the session, something of an achievement for a man still learning the circuit. In second now was Neuhauser, from Bakkerud and Kimball. The order kept changing, and a lap later Jelley was at the forefront, just ahead of Daniel Clarke (Double R Racing). A further swap came when Neuhauser took over the lead again. However, they still weren't getting close to the earlier session times. A sign that the major players weren't getting there yet was the temporary presence of Kohei Hirate (Team Rosberg) in 3rd, while Atila Abreu (ASL Mücke Motorsport) was now fastest in the session. 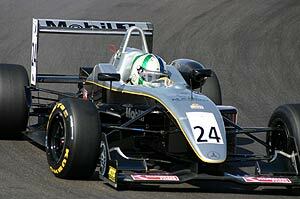 Ronayne O'Mahony (Fortec Motorsport) was fourth, which was highly unlikely to be brutally honest. Things began to normalise slightly, when Paul di Resta (Manor Motorsport) shot up the order and set the first of the 1.34s. Behind him (for all of a second or two) was Clarke, but he was just as abruptly replaced by Bakkerud. And then Abreu went fastest again, so things were clearly not at all normal yet. The constant swapping round continued as the tyres began to warm up, and Lewis Hamilton decided he was actually awake. He hit the 1.33s, a whole half second faster than anyone else, but still around 2 seconds slower than he had been earlier. Clarke was now speeding up to go 2nd, while local man Ross Zwolsman (Ross Zwolsman) was now 6th. Hamilton promptly upped the pace though, and was soon over a second faster than anybody else in the session. It began to look as if he might eventually get close to his own time. No one else was doing yet, that much was certain. Verdonck certainly wasn't likely to improve, after he went spearing off into the gravel traps, and a few seconds later so did Kane, the Northern Irishman skimming the surface of the gravel trap after he encountered one of the odd localised showers that sometimes afflict this place. He almost escaped, but just when it looked likely that he would drive out and go on his way, he hit an especially bumpy patch of gravel and ground to a halt. A brief spurt of experimental acceleration proved that he was bogged down, up to his axles in small stones. The resulting yellow flags led to a lack of progress while the wreckage could be shifted, and then it all started to happen again. Ferdinand Kool (JB Motorsport) was running midfield, and seemed to be fighting Jelley for 12th, which represented progress for Jelley, though it probably wasn't making Kool very happy. Meanwhile, Marco Bonanomi (Prema Powerteam) was 3rd in the session, while Hamilton was still not getting close to his morning time. He was pressing on relentlessly, nonetheless, and as time started to run short, he finally cracked the elusive 1.31 barrier. Maybe it was possible to improve on the previous times. The first man to manage it was di Resta, which was perhaps not surprising. That Bonanomi was 2nd in the session before it happened was. And Hirate grabbed 4th, with Bakkerud 6th. More to the point, Jelley was 10th, but that man Hamilton was proving untouchable. No matter that di Resta again improved his time, while Asmer was 5th. He promptly lost out to Kimball, but all eyes were on Hamilton. He was now absolutely flying, and the times were incredible. As a demonstration designed to demoralise everyone else, it was very effective, with the Euro Series boys being discouraged before they even arrived in the Netherlands. A 1.31.1998 was so much faster than last year's pole time as to beggar belief. Certainly di Resta had no hope of getting anywhere near that time, although he was hanging on to his 2nd place with a 1.31. Hirate was 3rd in the session, but had not managed to eclipse Kane, which was just as well perhaps. And then Hamilton really hammered his point home, with a 1.31.1747. There was absolutely no answer to that, even from di Resta, who had been working with his fellow Mercedes-driver, Hamilton, to get a tow. It really did look as if there was nothing anyone could do about the ASM boys. It only remained to be seen as to whether Adrian Sutil could complete the ASM front row lockout. And once the session times were combined, the order was Hamilton, di Resta, Kane, Hirate, Bonanomi, Duval, Neuhauser, Asmer, Kimball and Bakkerud. 11th was James Walker (Fortec Motorsport), from Clarke, Abreu, Zwolsman, Kool, Jelley, Thomas Holzer, (AM-Holzer Rennsport), O'Mahony and Verdonck. By the time the even numbers came out to play, the showery weather had passed over sunny. This time Alvaro Parente (Carlin Motorsport) was taking no chances, and was out on the track nice and early. The car hadn't been entirely right earlier on, and after taking two corners off in the untimed session, the Portuguese had been checking it out on old tyres in the first qualifying session. Meanwhile, Sutil was instantly fastest, only to be displaced by Lucas di Grassi (Manor Motorsport), who was in turn demoted by Franck Perera (Prema Powerteam). That left Sutil in 3rd, from Sebastian Vettel (ASL Mücke Motorsport), and Esteban Guerreri in 5th (Team Midland Euro Sport). Parente was 6th, while Ryan Lewis (T-Sport) was having a terrible time, but looked as if he might be able to improve, as he was now actually in the top ten. The HBR Motorsport runner, Alejandro Nunez, was now 8th, while Perera was playing catch up and topped the list. He was joined by Mike Conway (Fortec Motorsport), but Sutil had other plans, promptly setting a 1.32 to try and stake his claim on the front row. As with the even numbers, the tyres were taking a long time to come in, and no one was improving on their earlier times. We still had half the session left, however. Greg Franchi (Prema Powerteam) was struggling to get on the pace, and though he was up to 7th in this session, he really didn't look like a threat. Parente did, though, and was now 5th. However, just as Conway reclaimed 2nd, Sutil was getting ever close to the 1.31 he needed to try and challenge Hamilton. Conway's challenge had the edge take off when he got a wheel into the dirt and found himself taking an unexpected off track excursion through the gravel. It wasn't exactly the best way to treat his tyres, and it also covered the track in gravel for everyone else, which doesn't make you popular really. As it was, most people were in the pits by then anyway, as everyone seemed to decide it was time for a tyre change at the same time. Someone who didn't get that far was Alvaro Barba (Hitech Racing), the inexperienced Spaniard ending up stranded in the gravel. Bruno Senna (Double R Racing) may have ignored the yellow flags to improve to 13th, though he'd been so slow earlier on that it was possible he had lifted and still gone faster. In complete contrast Perera was still charging hard, and was now 2nd in the session. And then we finally got the first real improvement. Surprisingly, it came from Giedo van der Garde in the Team Rosberg car. That seemed to have been the signal Sutil was waiting for, and he too improved on his earlier time. Senna was now starting to string it all together, and was now 5th. And then the sun came out properly, and we had precisely the conditions you want for an F3 engine and car to be at their best. Guillaume Moreau () shot up to 6th, while di Grassi claimed 4th. He was shuffled back by Guerreri, and then lost another place to a determinedly dogged van der Garde. Parente slotted in ahead of the Dutchman, before di Grassi grabbed a front row place. Senna was up to 8th, no longer fighting Lewis, the latter having yet another off, this one landing him in the nearest available gravel trap, from which he would not emerge without outside assistance. Vettel dragged his seemingly reluctant mount up to 4th, just ahead of Parente. Di Grassi again improved, and it looked as if he might just join Hamilton on the front row. However, that was to reckon without Sutil. The German was 2nd right until the end of the session, when he too managed to find that extra burst of speed to claim the front row slot, a time of 1.31.441. He would have to concede pole to Hamilton, but he wasn't far off the Englishman's pace. And so, at the flag, the combined order for the even numbered cars was Sutil, from di Grassi, Perera, van der Garde, Parente, Guerreri, Vettel, Conway, Senna and Moreau. 11th was Franchi, from Ho-Pin Tung (JB Motorsport), Nunez, James Rossiter, (Signature-Plus), Lewis, Barba and Keiko Ihara (Carlin Motorsport). Sunday's race looks like being a complete ASM benefit. But anything can happen here, and it probably will. I hope tomorrow goes really well." Experience is important, and I'm a better driver now, so this year I'll try to push." The fastest Dutchman on the grid, van der Garde, was also a disappointed man, though he knew he had no chance of getting the better of the ASM runners. "I'm a little bit disappointed. First qualifying was good, and I got good first sector times, but I kept being blocked in the second sector. For the second session we changed some things, and didn't do quite so well. I would be happy with the top 5. Of course I want to beat these guys" (the ASM drivers), "but they have been doing well all year so further up the order seems to be impossible. The best any of us can hope for is being third behind them, which makes us the best of the rest. "